Cheapest Disneyland Anaheim tickets - Must purchase by May 26th, 2012. You can only find these discounted tickets here for hopper Disneyland tickets. Three day hopper for only $194. See details. Ride on the new SeaWorld roller coaster called the Mantra rollercoaster. Buy discounted SeaWorld San Diego Tickets! 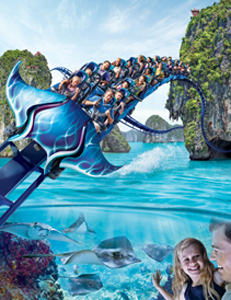 The new MANTA ride opens on May 26th! Twitching of the left eyelid - 2 days in a row! My left eyelid has been twitching for the last two days and it is really annoying. It's been doing this all day; morning, afternoon, night for every few minutes or seconds. I'm so tired and working a lot on the computer and maybe these have to do with my symptom of the eye. The other night I only had 3 hours of sleep so I know I'm sleep deprived as well.